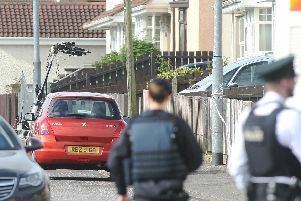 The PSNI has appealed for information following a shooting incident in the Cityside yesterday, Sunday, at 7.30pm. Police received reports of shots being fired in the Fanad Drive area of the city just before 7.30pm. Detective Inspector Lindsay Kitson said: “It was reported that two masked men entered the garden of a house and fired shots in the air. No-one was injured in the incident but the street was sealed off for several hours..
“I would ask anyone with any information about this incident to contact detectives at strand Road Police Station on the non emergency number 101. Councillor Kevin Campbell said those behind the shooting had no support in the community. He said those responsible needed to “give themselves a shake”. “It’s absolutely disgraceful,” he said. “You have children out playing, it’s a beautiful summer’s day, everyone’s enjoying themselves, and then we have someone coming along and firing shots. “Where does this madness end? They’re way behind the times, they need to move on. “Whatever is behind it, there’s no need for guns.